A high-level delegation of the World Bank and the International Finance Corporation, including Executive Director of World Bank for Maldives Mr. Merza Hussain Hassan, the World Bank Vice President for South Asia, Mr. Hartwig Schafaer and Ms. Nena Stoiljkovic, IFC Vice President for Asia and Pacific paid a courtesy call on His Excellency President Ibrahim Mohamed Solih, this evening at the President’s Office. During the call, President Solih welcomed the delegation to the Maldives and highlighted that this year marks the 41st anniversary of the establishment of engagement between the Maldives and the World Bank. Speaking during the meeting, President Solih acknowledged and extended deep appreciation for the generous support and assistance provided to the Maldives over the years. The President noted that the Maldives faces a myriad of challenges. 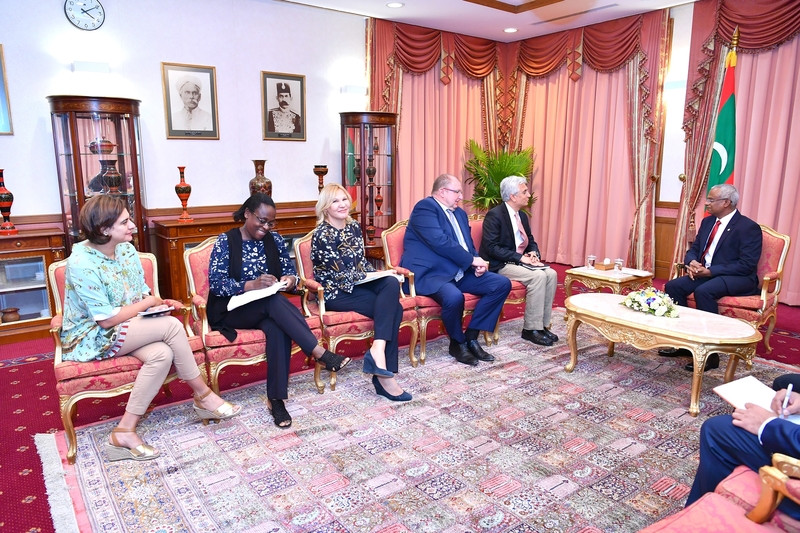 He emphasized that the Government is committed to overhaul public finance management, asset recovery and infrastructure development in the Maldives. The President further highlighted on prioritization of decentralization to achieve overall national development felt on all levels of the society. The delegation from the World Bank commended the Administration’s forward-looking governance policies and plans for development, noting that the outlook is deemed both ambitious and promising. The delegation expressed their openness to offer financial and technical assistance to operationalize the pledges outlined in the Government’s manifesto and help actualize its development vision. Chief amongst the areas deliberated on include improving the capacity of the banking system, promotion of small and medium enterprises, job creation, executing housing projects, renewable energy production and in supporting the Government’s decentralization agenda. The call concluded with both sides resolving to work closely in the coming months and years to fructify the mutually agreed upon areas of development.